Hey guys, looong time reader/lurker but new member. Both come in m42 mount. I've been scanning the net for some examples and usually find my satisfaction on this forum whenever I need information before buying, however not with these lenses, there's not much information online and couldn't find any sample photo's. Does anyone have any examples photo's of these in action so I know what to look for when I test these out before buying? Any information on these lenses would be great. I've seen some great auto-D samples but from what I've read so far these are optically different. They have the same no. of elements their auto-D counter part. What is the evidence you heard to show that they are optically different? I read it somewhere, but that's the thing, you can read a thousand stories of takumars. Steinheil macro's seem to have very little to no information online. I made the purchase, haven't had much time to test, but from what I've seen so far very happy with the quality. Then, the one ending in 'aron' must be simple yet complex. I was actually looking for a steinheil triplet design on a local selling site and then stumbled upon the quinar(on) by pure chance. I asked the seller if he was selling a 35 or 135 since the picture didn't make it clear, he then said he had both up for sale. I picked them up yesterday. Both perform wonderful in the short time I had to test, the 35mm reminds me a bit of the 'simple' 35mm flektogon. Both are in pristine condition, the seller was the first owner and bought them brand new in the early 70's. It was like finding a car that has almost zero milage and was always in the garage. One thing I noticed though was that they both have with their original hoods, the 135 has 2 hoods, they seem to be 55mm but my 55mm step-up rings don't fit, neither do the hoods to other lenses with 55mm filter threads, 52mm also didn't fit, they seem to be around 54mm. Can anyone confirm? Also finally found a chinese website with a wide variety of pictures taken with steinheil. 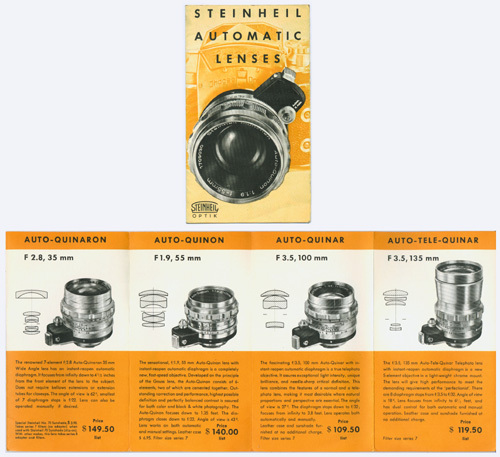 It always interested me how lens designs get their name but they all end in either 'on' 'ar' or 'lux'. What's the history behind this? So I finally managed to edit some clips with the 135mm macro Quinar. Footage of the 35mm macro quinaron will follow. Excelente lens for macro, portraits sms general use.